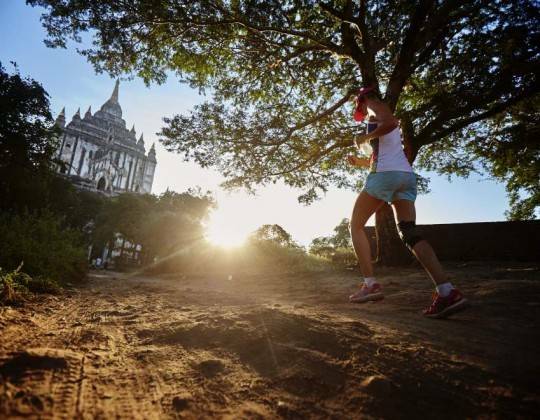 Petras’ rock carved facades and extensive tunnels have fascinated legions of explorers and archaeologists and with Sports Tours International you can combine exploration of this extraordinary city with a challenging marathon experience. 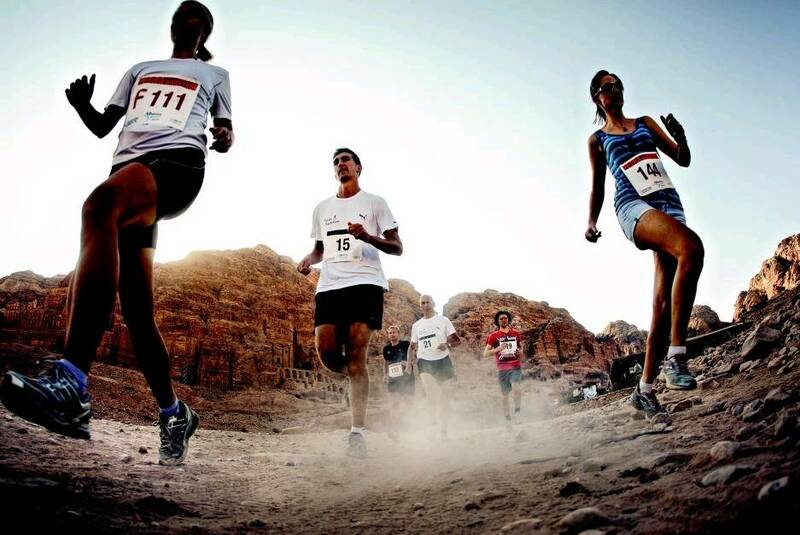 The Petra Desert Marathon starts from the street of facades in the ancient city of Petra, Jordan. 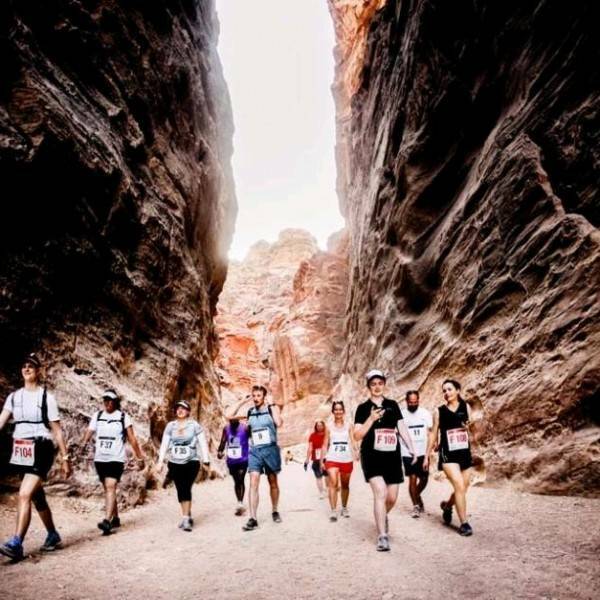 The marathon route passes through the mountains around Petra, taking in the mountain monasteries and monuments carved into the rock. 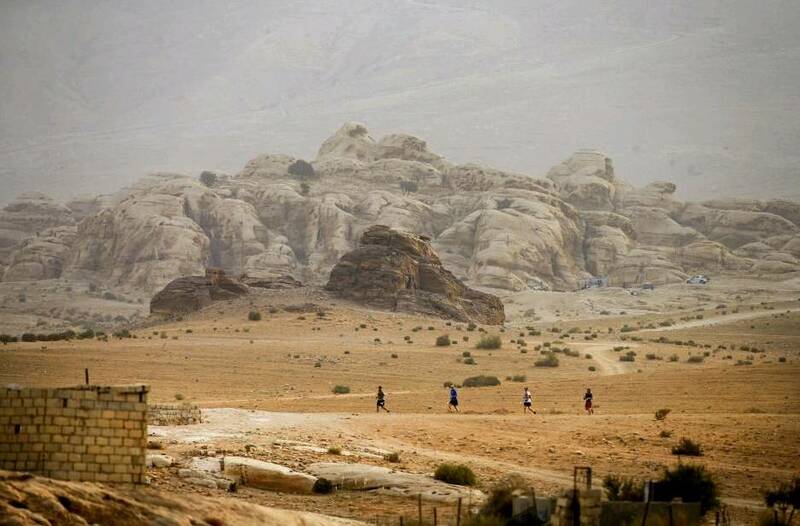 After leaving the Petra historic site area, half marathon runners will move directly to a dried river bed while those taking on the longer distance will loop around the desert hills before finishing just before the Petra visitor centre. 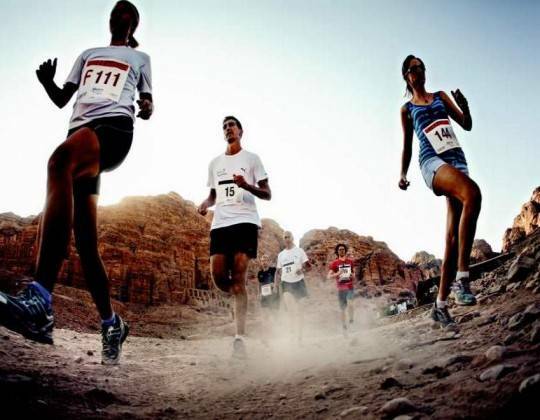 The Petra Desert marathon consists of a full marathon and a half marathon. 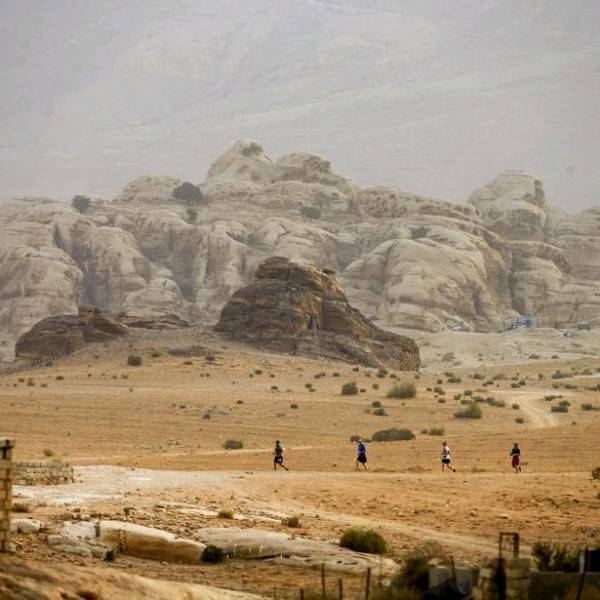 The event is part of a 4 night / 5-day tour package which includes social events, tours, hotel accommodation, entry pass for Petra and a dip in the Dead Sea. If you wish, we can offer extension packages. Note: Bookings are on a request basis and can take 24 working hours to confirm. Once your booking is confirmed, you are then free to book your flights. For prices, please click on the hotel options tab. Extension packages are on a request basis. To check availability/add to your main booking please EMAIL us. Cultural Extension 3 night/4 day – 9th to 12th September £519 per person based on double/twin and £678 per person based on single. Start the day with a visit to the historic city of Madaba, famous for the ancient “Mosaic of Jerusalem”, one of the oldest pictured testimonies of the Hold City. You then continue to Mount Nebo, the mountain where Moses saw the Holy Land before finding his final resting place. You then continue down the Jordan Valley to Bethany Beyond the Jordan, better known as Baptism Site. you finsih back in Amman when you will check into the hotel. Today we will be heading to the small town of As-Salt. Being a living museum, As-Salt features old lanes and dazzling houses from the late Ottoman period and a walking tour through this inviting community showcases some of Jordans most charming buildings and bazaars. In As-Salt, many traditional businesses and skilled artisans enrich the city’s cultural life, and as you walk down the street, you will see a variety of different trades and shops, including blacksmiths, shoemakers, barbershops, Arabic sweet stores, and herbalists. After breakfast we head to the Castle of Ajloun, another highlight of northern Jordan. The Qalat er-Rabad, as the Ajlun Castle is locally known, was the base of the Arab forces of Saladin, when he defeated the Crusaders in the 12th century. The Ajlun Mountains are famous for their lush vegitation and thick green forrest. We then drive north through the Jordan Valley to the excavated city of Jerash, Pompeii of the East. These well-preserved ruins were once the ground pillars of a Roman Decapolis city built in approximately 330 BC. In its peak the city flourished from trade with the Nabateans from Petra and was one of the most important cities in the Roman province. In 747 AD Jerash was hit by an earthquake and slowly the city was abandoned. As the years went by sand covered the columns and buildings, which is why everything was so well preserved when a Russian expedition excavated the city in 1878. After lunch in Jerash we drive back to Amman. In the evening we will drive to a local restaurant in Amman for a Jordan farewell Dinner together. Breakfast, lunch and dinner included. Our adventure in Jordan is over and it’s time to bid farewell to this extraordinary country. Checkout from the hotel must be completed before 12:00 noon. All participants are transferred from Amman to Queen Alia International Airport. 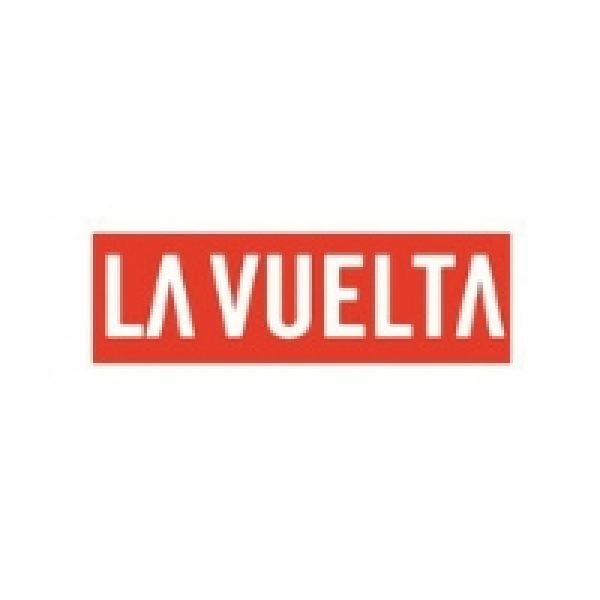 Three transfers are available and ARRIVAL times at the airport are 05:00, 13:00 and 18:00. It is possible to book a different transfer to Amman if the above scheduled group transfers don’t fit your onward journey (extra charge). Breakfast included this day. Adventure 3 night/4 day – 9th to 12th September £599 per person based on double/twin and £754 per person based on single. Vast, echoing and god-like is how T.E. Lawrence described the Wadi Rum desert, also known as Valley of the Moon, and now it’s our turn to get lost in this stunning desert and sleep under the stars. After breakfast we leave Petra and drive to the magnificent Wadi Rum desert. It was here the British army officer T. E. Lawrence gathered the Arab tribes to revolt against the Ottoman Turkish rule during World War I, a story that reached world fame in the movie “Lawrence of Arabia”. From the Wadi Rum Visitors Centre we change from bus to jeeps and go on a tour in the desert past sand dunes and incredible rock formation. After a cup of tea made by Bedouins, the tour ends with dinner and overnight in Sun City Bedouin Camp with the choice of a Bedouin Tent or a Martian Dome. All meals included today. We enjoy breakfast Bedouin style before the jeeps bring us back to the Visitor Centre where our bus will take us to the village of Tafilah. From here we set out for an 8km hike through the Dana Valley – one of Jordans premier nature reserves. 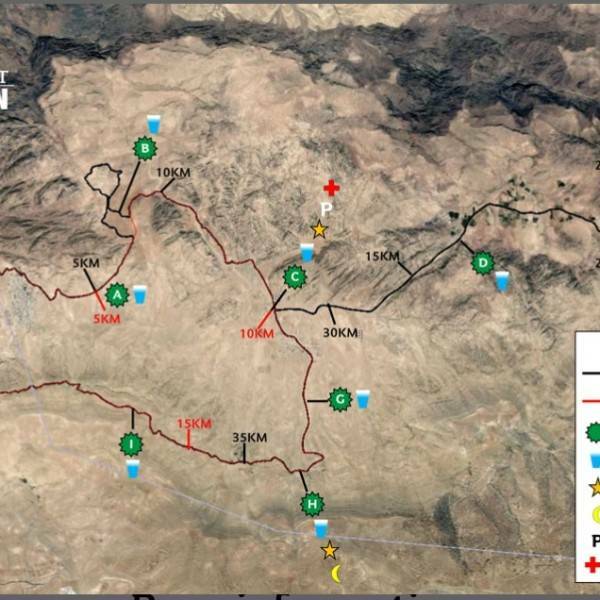 The trail contours the huge escarpments of Wadi Dana and offers breathtaking views of the canyon-like valley while passing through terraced gardens. After about 4 hours we reach Rummana Camp from where we drive to Grand East Hotel Dead Sea for the night. Breakfast and lunch included today. We have breakfast at our hotel and then enjoy a free day at the Dead Sea. After lunch we drive to the Wadi Mujib gorge, in many ways similar to the Siq in Petra – narrow and with towering cliffs rising on both sides. Through the gorge runs the Mujib River and this unique nature reserve is home to over 400 species of plants, more than 100 species of birds and animals like the Nubian Ibex, Red Fox, Hyena, Jackal, Wild Cat, Caracal, Badger, Mongoose, Wolf and Arabian Leopard. 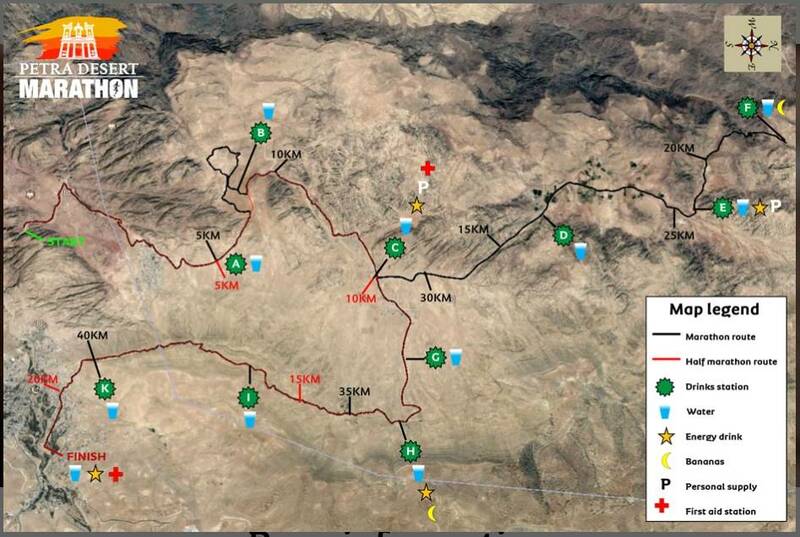 We will see the Wadi Mujib on our 2 hours hike and swim through the river and nature reserve. Later we head to Amman where we check in to our hotel. Breakfast and lunch included today. Checkout from the hotel must be completed before 12:00 (noon). All participants are transferred to Queen Alia International Airport in Amman. Four transfers are available with ARRIVAL times at the airport on 3 September as follows: 05:00, 08:00, 13:00 and 18:00. It is possible to book a different transfer to the airport if the above scheduled group transfers don’t fit your onward journey (extra charge). Breakfast included today. Thoroughly enjoyed the experience and would certainly recommend to anyone thinking about it. The whole package is meticulously organised and attracts a small but eclectic field of enthusiast from over 30 countries. 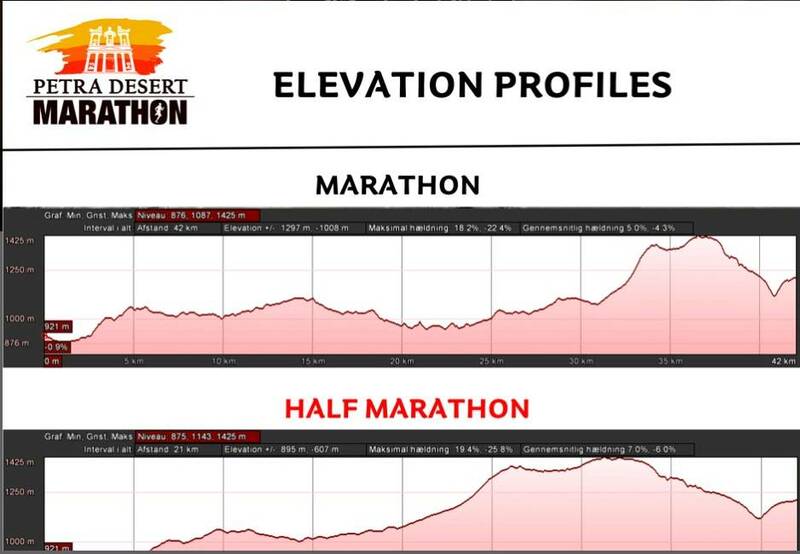 The course is demanding with some challenging road hills and sandy trails. 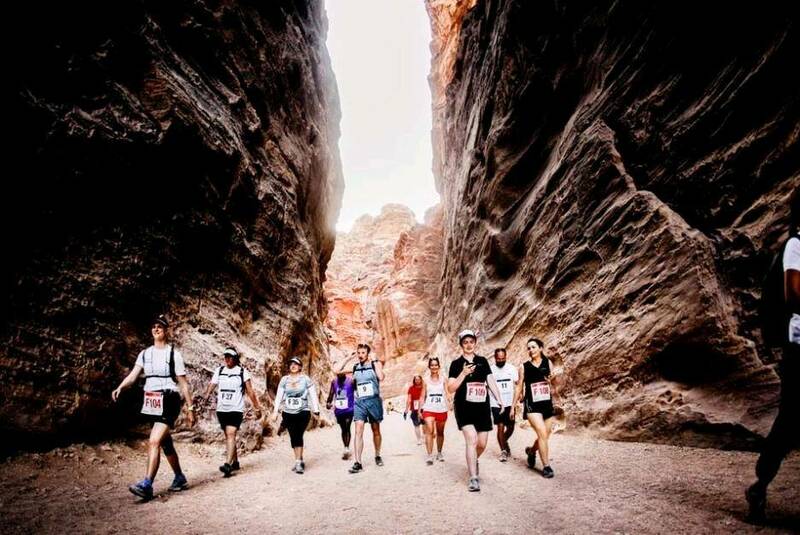 There are water stations every 4K and the start through the ancient wonder if Petra is unforgettable. 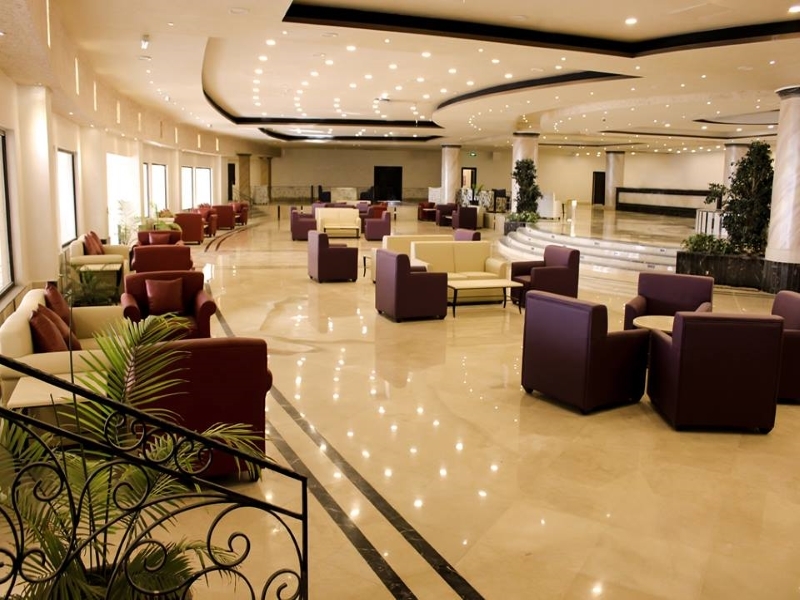 Day 1 – 5th September –Arrive in Amman Queen Alia International Airport (AMM). There is no set arrival time, so you can book the flight most suitable from your departure airport. The tour offers a selection of three different hotel levels: Standard and Deluxe. Upon arrival our airport representative will meet you in the arrivals hall, after you’ve cleared immigration and customs, and guide you to the taxi stand. Transfer to the hotel in Amman is at your own expense, but fares are set (expect JOD 25 for a one-way ride from the airport to Amman city). After check-in you have the rest of the day/evening free to relax in your room or explore Amman on your own. No meals are included today. Upon arrival our airport representative will meet you in the arrivals hall, after you’ve cleared immigration and customs, and guide you to the driver that will take you to your hotel at the Dead Sea. 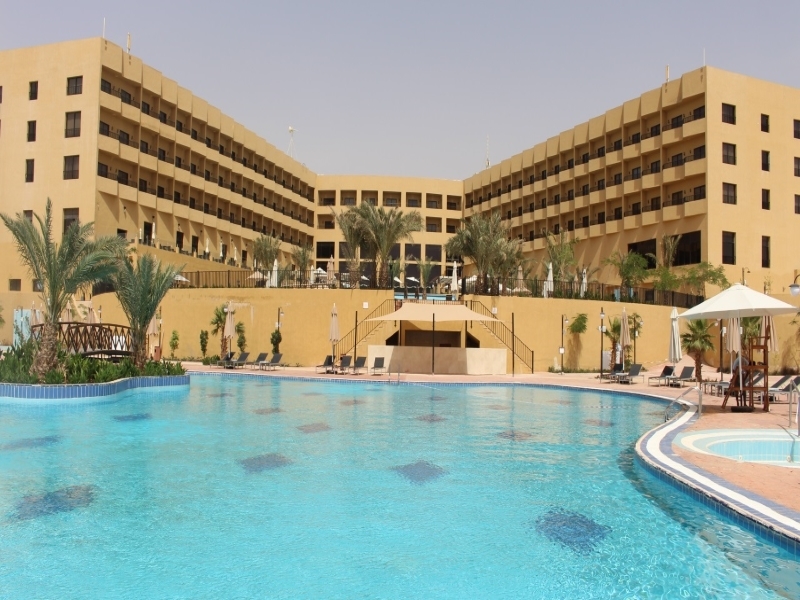 Transfer to the Dead Sea is included in the package cost and will be arranged according to your arrival. 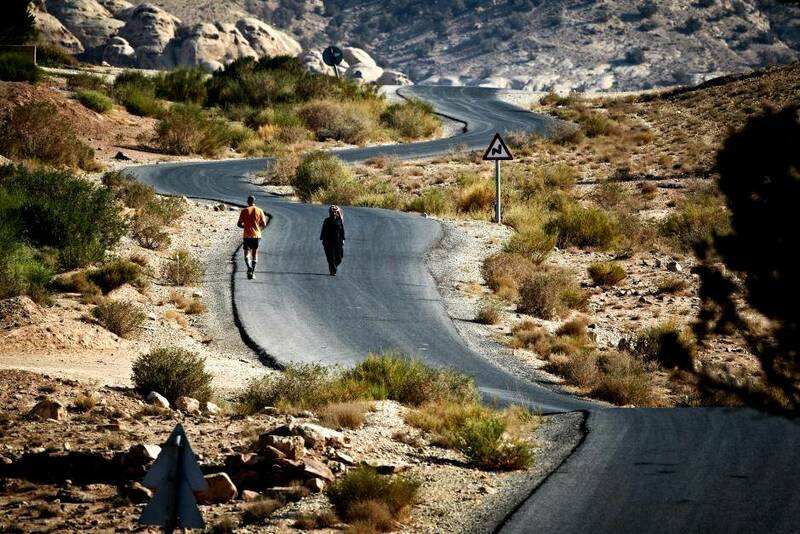 Note, however, that other Petra Desert Marathon participants could arrive at the same time as you in which case you will share the bus with them. Waking up at the Dead Sea – the lowest point on Earth – you can start the day with breakfast at the hotel, a swim in the Dead Sea and relax by the pool. In the early afternoon we check out and drive by bus to Wadi Musa (Petra). On the way we stop for lunch and upon arrival in Wadi Musa we check in at our hotel not far from the entrance to Petra. After breakfast at our hotel in Amman we check out and drive by bus to Wadi Musa (Petra). As we arrive we go straight for lunch at a local restaurant while we wait for our rooms to be ready for check in at 15:00. As the sun sets all runners meet at tomorrow’s finish area where the race officials and medical team will give a briefing about tomorrow’s run. In the evening we can carbo-load with the pasta dinner served in our hotel restaurants. Breakfast, lunch, and pasta dinner included today. The day we have all been waiting for! 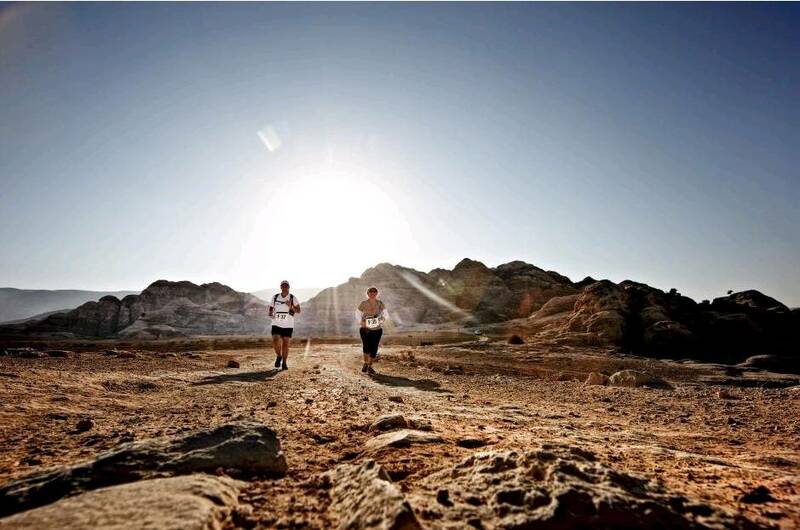 After an early wakeup call and breakfast, all runners meet outside the Petra Visitor Centre. At 05:15 all participants walk through the Siq to the start line at the Street of Facades. 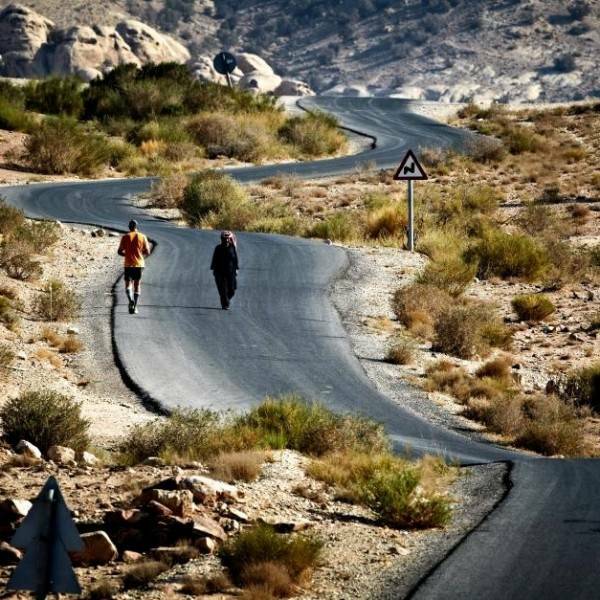 As Petra is not open to the public at that time of day, runners will get the unique experience of seeing Petra without the crowds. 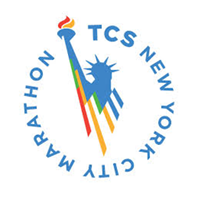 At 6:30 am the race starts for both full and half marathon runners. 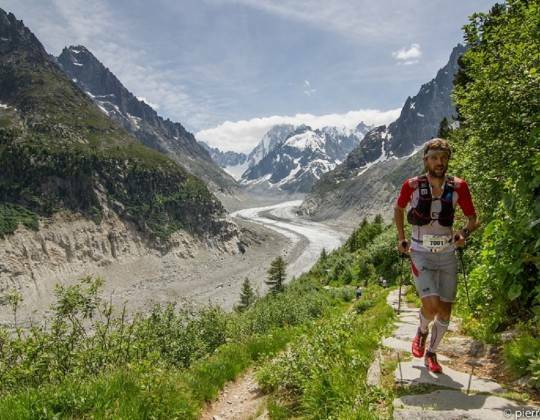 Although regarded as an official race following international competition rules including time taking, it is important to remember that it is first and foremost an Adventure Marathon in which the experience, scenery and satisfaction in completing is more important than winning or setting a personal record. 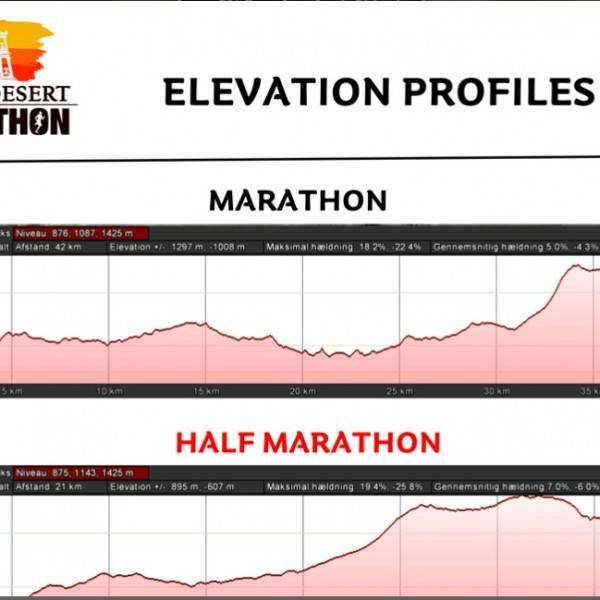 For a detailed description of the marathon day and route, have a look at the race info section. Runners receive their medals and refreshments at the finish line. In the evening we offer two optional local experiences – Petra by Night and Petra Kitchen – that can be booked in addition to the tour package. A light continental breakfast and packed lunch at the finish area are included today. Day 4 – 8th September – Today is the day to explore Petra at its full glory. After breakfast we walk to Petra Visitors Centre from where we will start our guided tour on foot and learn about the impressive history of yesterday’s starting point. The main entrance to the historical and archeological city of Petra is the Siq. With walls rising up to 200 metres in height, this narrow gorge, split apart by tectonic forces, winds its way 1.2 km through the mountains and ends at Petra’s most elaborate temple, the Treasury. We continue past the marvellous tombs and caves carved out of the red sandstone cliff while our guide tells us about the old Nabateans who created the city. After some time to explore the area and buy lunch on our own we head back to our hotel. Depending on how much time you want to spend in Petra you can also relax and recover from the strenuous efforts of yesterday in one of the areas’ Turkish baths and spas or simply treat yourself at a local restaurant with the incredibly tasty Jordanian cuisine. 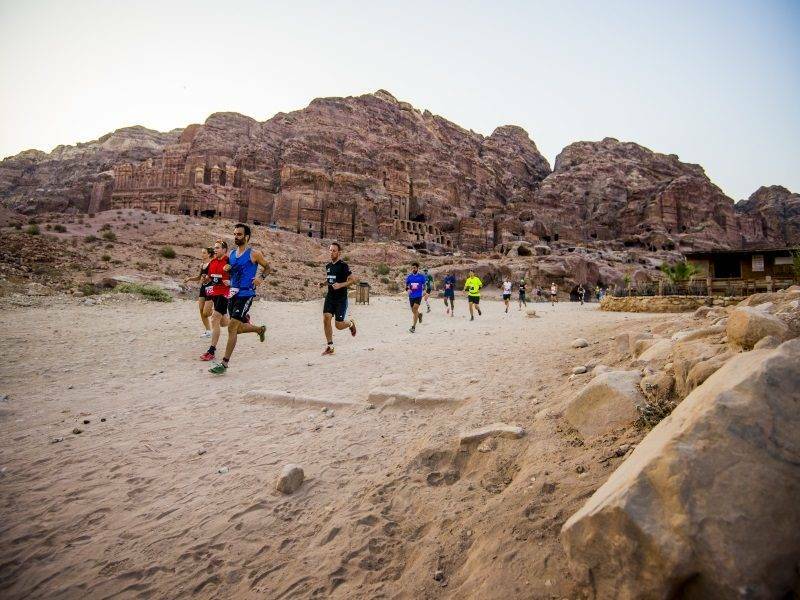 In the evening all participants depart from the hotel to the desert where we celebrate the completion of the Petra Desert Marathon with a festive celebration dinner. Dine, drink and dance under the stars. Breakfast and celebration dinner included today. Our adventure in Jordan is over and it is time to bid farewell to this extraordinary country. Checkout from the hotel must be completed before 12:00 (noon). All participants are transferred to Queen Alia International Airport in Amman. Four transfers are available with ARRIVAL times at the airport on 9 September as follows: 05:00, 08:00, 13:00 and 18:00. It is possible to book a different transfer to Amman if the above scheduled group transfers don’t fit your onward journey (extra charge). Participants who book one of the extensions will start these adventures after breakfast today. Breakfast included today. 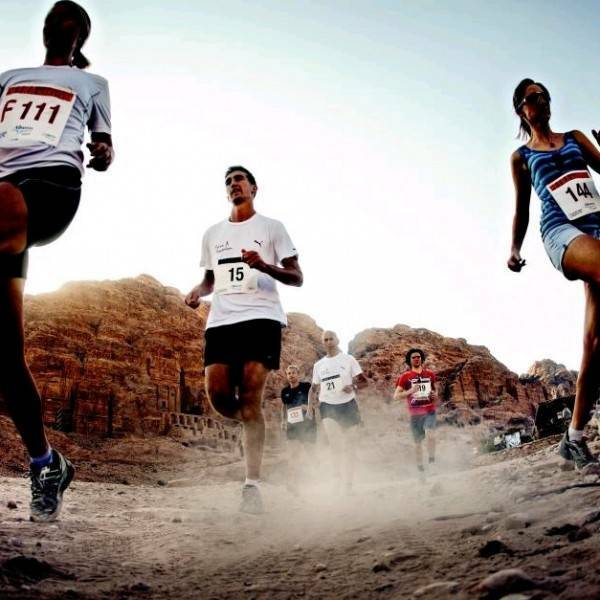 For the Petra Desert Marathon, we offer three hotel standards. 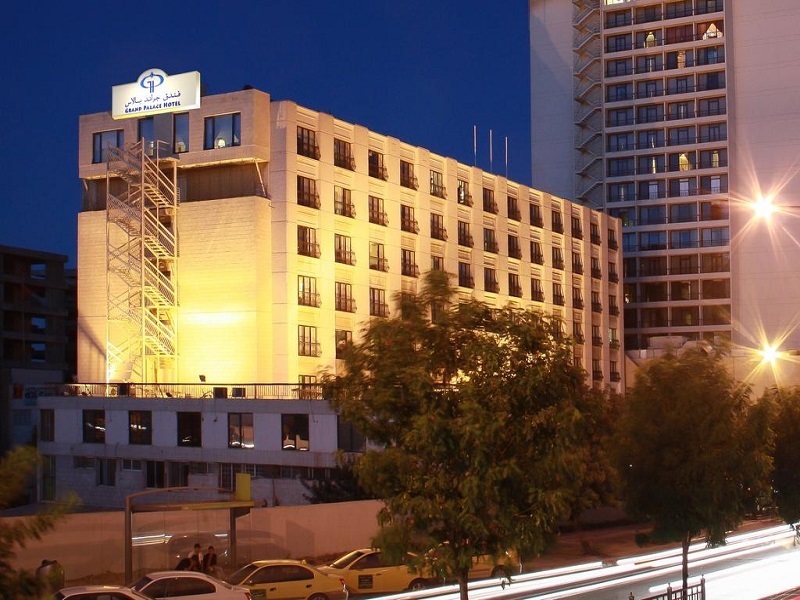 Grand Palace Amman Hotel -Centrally located in Amman’s most progressive district, Shumesani, the hotel has an idyllic setting for business or leisure, next to the Royal Cultural Centre and the Amman Stock Market. 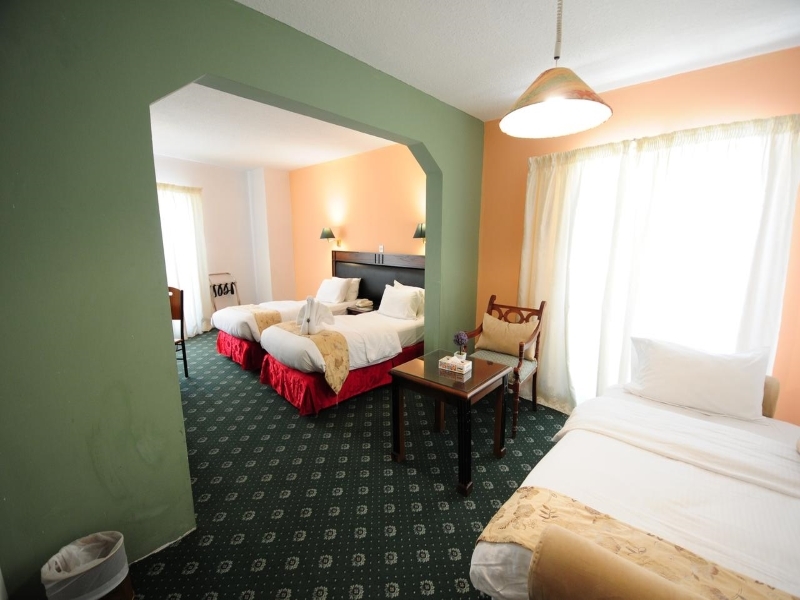 The hotel is within short walking distance from the shopping, commercial and banking centres. Staff can help you arrange your meetings, a trip to the Dead Sea, Petra or any surrounding attractions. 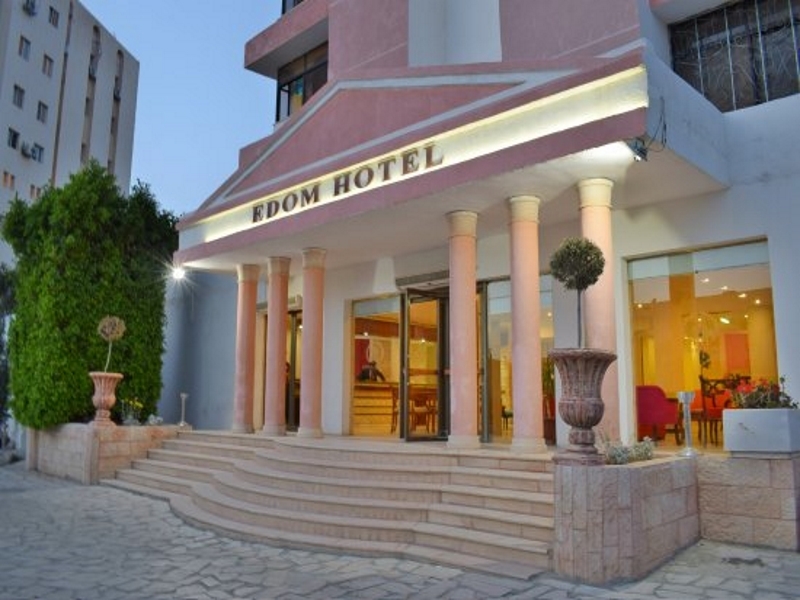 Edom Hotel – The Edom Hotel is classed as one of the best hotels in Petra, located near the entrance to the historical site of Petra, just 200, away. The hotel has 135 air conditioned rooms with private bathrooms. Rooms also include a mini bar, satellite TV, telephones, laundry and room service. 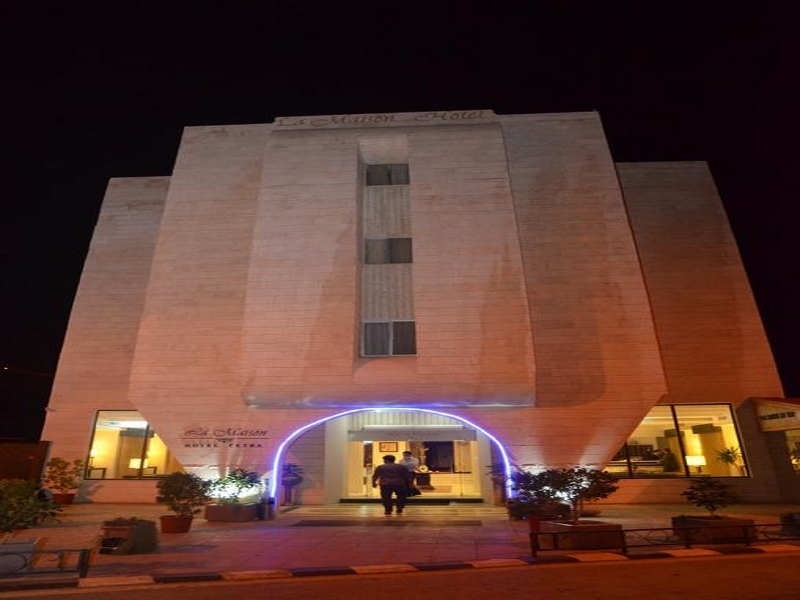 Hotel Grand East Dead Sea – The Hotel Grand East Dead Sea is a true gateway directly to the sun-blessed beach of the Dead Sea. This family friendly hotel is located in the heart of Dead Sea, the ideal escape for a memorable experience and refreshing vacation. The hotel has many amenities for you to enjoy including restaurants and a spa centre. Ladies can also enjoy private, segregated outdoor swimming pool. 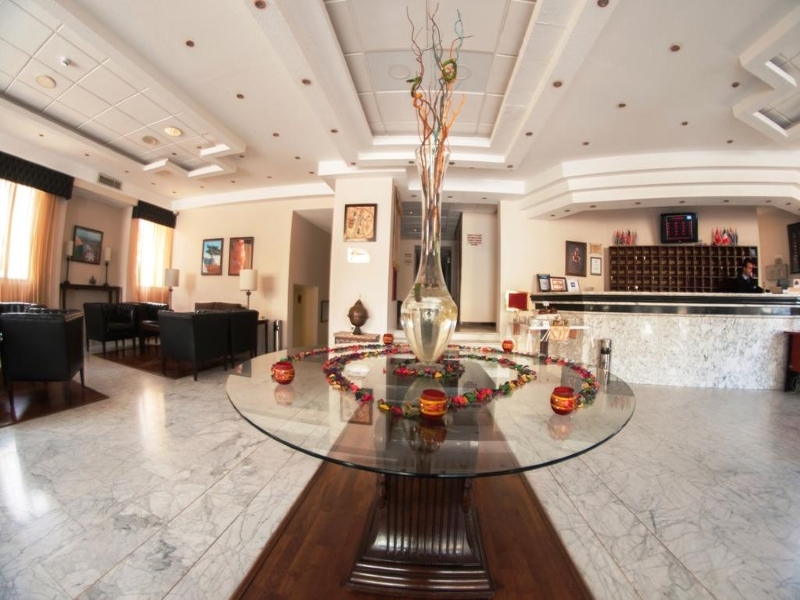 The hotel was designed and developed to fulfill all your needs and desires. Le Maison Hotel Petra – La Maison Hotel is uniquely located in Wadi Musa, a 5-minute walk from the Jordanian world wonder, the Red Rose City of Petra. Hotel La Maison offers air-conditioned guest rooms with satellite TVs. The hotel has its own Lobby Lounge called The Basha. Guests can enjoy a meal or drink here anytime during the day. 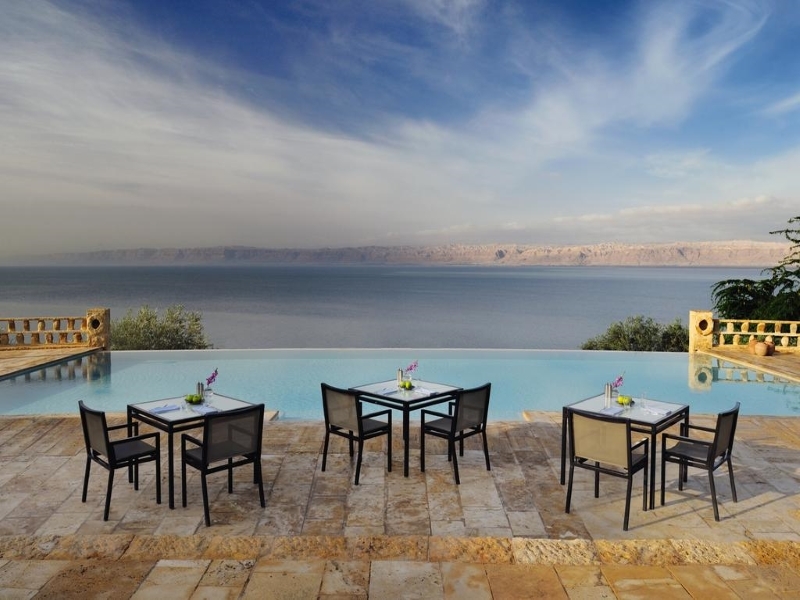 Movenpick Resort & Spa Dead Sea – The luxury Mövenpick Resort & Spa Dead Sea is found in a traditional village setting nestled amongst lush gardens. 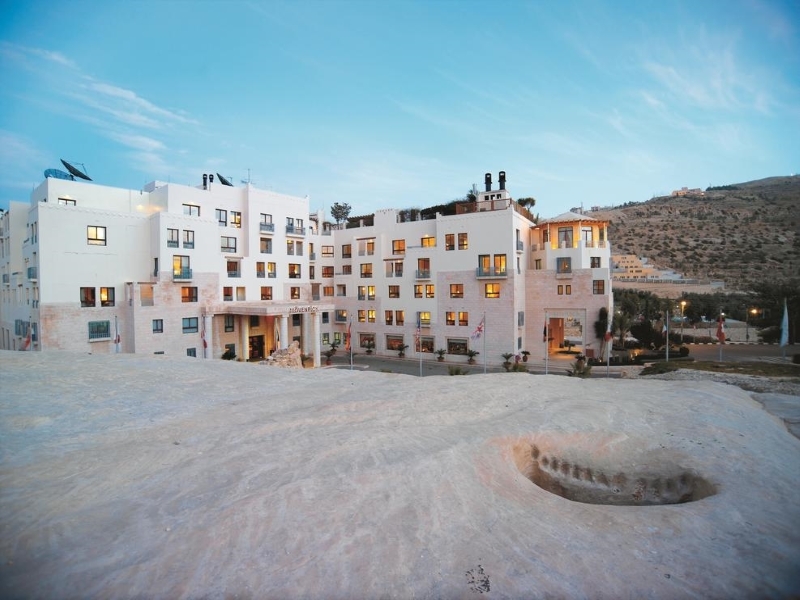 The resort is set on the northern shores of the Dead Sea, at the lowest point on earth. With your well-being and balance in mind, this resort is an oasis of tranquillity. 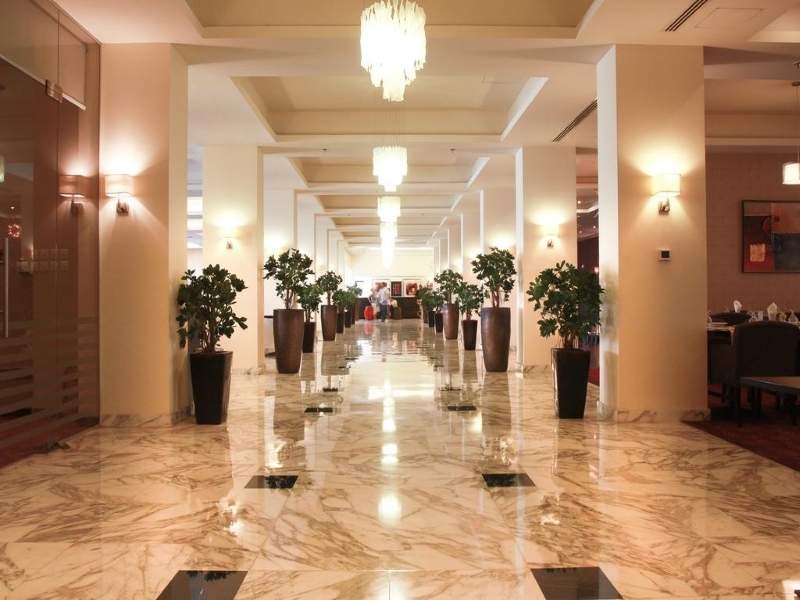 Movenpick Hotel – The Movenpick Resort Petra is located directly at the entrance to the ancient city of Petra. The hotel’s rooftop garden terrace offers views of the hills. Located opposite the Petra Visitor Centre. Rooms at The Movenpick Resort Petra have a private outdoor balcony. They feature white linens and bright windows. Each has a work desk and is equipped with air conditioning and satellite TV. The Al Saraya all-day-dining restaurant and Mediterranean Al Iwan restaurant offer a large selection of dishes. 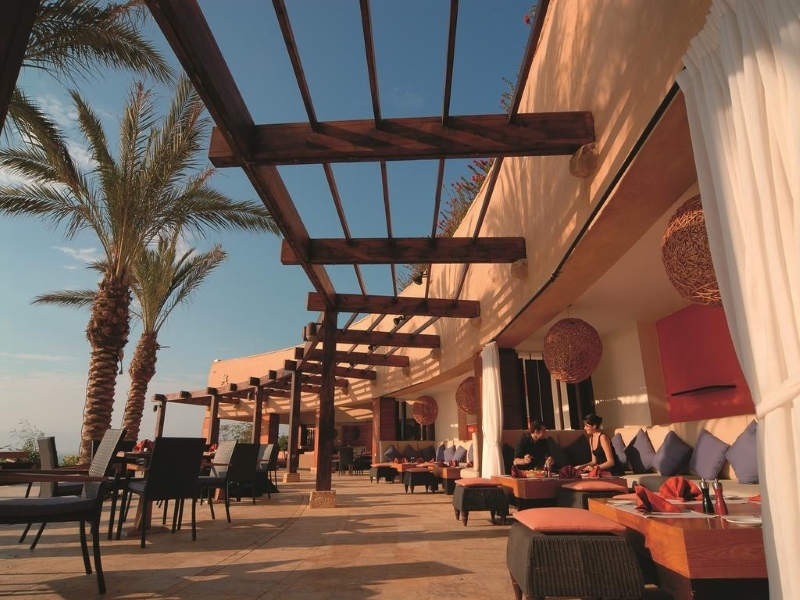 The Al Maqa’ad Bar features carved wooden screens, while the Al Ghadeer roof Garden boasts views over Petra’s hills. Please call +44 161 703 8161 to check availability and to book your package. A 30% non-refundable deposit is payable at the time of booking plus entry fee. A copy of your passport will be required in order for visa purposes. Please email this to running@sportstoursinternational.co.uk. At Sports Tours International we aim to ensure you have fantastic trip away we also aim to ensure all of our customers are safe when traveling. Please find the time to read our ‘Keeping Safe travel guide’ here.